Own Last Of The Summer Wine Series 1 to 31 Complete Collection DVD from Deff, DVD, Blu-Ray & 4K Video Specialists - Free UK Delivery.. Starring BILL OWEN as Compo, PETER SALLIS as Clegg and BRIAN WILDE as Foggy and FRANK THORNTON as Truly. In the beautiful and tranquil village of Holmfirth, love is frequently in the air. And more often than not, it only takes a glimpse of some wrinkly stockings to make a certain scruffy little lothario's heart race. And you never know, the mobile dating agency that's appeared in the area could help matters along - will Nora Batty final..
Own Last Of The Summer Wine Series 1 to 10 DVD from Deff, DVD, Blu-Ray & 4K Video Specialists - Free UK Delivery..
All 28 episodes from the first four series of Roy Clarke's long-running BBC sitcom set in the Yorkshire Dales. Series 1 episodes are: 'Short Back and Palais Glide', 'Inventor of the 40-Foot Ferret', 'Paté and Chips', 'Spring Fever', 'The New Mobile Trio' and 'Hail Smiling Morn Or Thereabouts'. Series 2 episodes are: 'Forked Lightning', 'Who's That Dancing With Nora Batty Then? ', 'The Changing Face of Rural Blamire', 'Some Enchanted Even.. Starring BILL OWEN as Compo, PETER SALLIS as Clegg and BRIAN WILDE as Foggy, taking over from Seymour Utterthwaite. played by MICHAEL ADRIDGE. As the lazy summer days drift endlessly on in the peaceful Yorkshire countryside, we see our old friend Foggy return to the Holmfirth fold, bringing with him a whole host of brand-new, hair-brained ideas. But it won't be long before he discovers that much is still the same hereabouts. In fact he .. Starring BILL OWEN as Compo, PETER SALLIS as Clegg and BRIAN WILDE as Foggy plus special guest star NORMAN WISDOM as Billy Ingelton. What’s the best way to get a sneak-peak through Nora Batty’s bedroom window? Do stoneworms really exist? And just who is that mysterious motorcyclist? These are just some of the questions that abound in the lovely Yorkshire village of Holmfirth, where the sun never sets on our intrepid trio of rather advan.. Starring BILL OWEN as Compo, PETER SALLIS as Clegg and FRANK THORNTON as Truly. There are lots of things to prepare for in our latest outing to Holmfirth, on the edge of the Pennines. There's a charity sponsored kiss for one thing, and a good old fashioned thumpy-dub contest for another. There's a nostalgic trip to France, and the arrival of the mysterious Phantom Number 14 bus too. But even Lester Coalville's machine that detects earth..
All 20 episodes from the 25th and 26th series of Roy Clarke's long-running BBC sitcom set in the Yorkshire Dales. Series 25 episodes are: 'The Lair of the Cat Creature', 'Ancient Eastern Wisdom - An Introduction', 'A Pick-Up of the Later Ming Dynasty', 'The Secret Birthday of Norman Clegg', 'In Which Gavin Hinchcliffe Loses the Gulf Stream', 'The Miraculous Curing of Old Goff Helliwell', 'The Frenchies Are Coming', 'The Man Who Invented..
We return to the beautiful Yorkshire village of Holmfirth where our famous trio of troublemakers has officially become a quartet. Spreading their usual chaos and mayhem wherever they go, Clegg, Truly, Alvin, and Billy are back for more mischief. 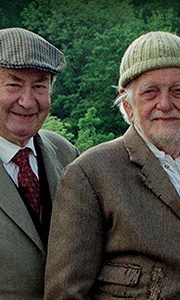 Follow the boys as they meet a stranger planning to float to Ilkley on an inflatable swan, encounter a womanising flower arranger, and come up with a devilish plan to get rid of Clegg’s unwelcom..
All 21 episodes from the 29th and 30th series of Roy Clarke's long-running BBC sitcom set in the Yorkshire Dales. Series 29 episodes are: 'The Second Stag Night of Doggy Wilkinson', 'What Happened to the Horse? ', 'Variations On a Theme of Road Rage', 'In Which Howard Gets Double Booked', 'Will the Nearest Alien Please Come In', 'Elegy for Small Creature and Clandestine Trackbike', 'The Crowcroft Challenge', 'Must Be Good Dancer', 'In Wh.. Starring BILL OWEN as Compo, PETER SALLIS as Clegg and BRIAN WILDE as Foggy. Welcome to Holmfirth, a breathtakingly beautiful village in the heart of the West Yorkshire Dales, home to our three favourite idiosyncratic, retired gentlemen, as well as the BBC's longest running comedy series. Here we meet these one-time school chums - Compo, Clegg and Foggy - long since left school, but now enjoying a mischievous second childhood, devising ..
All 16 episodes from the 31st and 32nd series of Roy Clarke's long-running BBC sitcom set in the Yorkshire Dales. Series 31 episodes are: 'Some Adventures of the Inventor of the Mother Stitch', 'The Mother of All Mistakes - Or Is It? ', 'Will Howard Cross the Atlantic Single Handed? ', 'Who's That Looking Sideways at Nelly? ', 'Nobody Messes With Tony the Throat', 'Will Stella Find True Love With Norris Fairburn? ', 'Will Randolph Make a Go.. Starring BILL OWEN as Compo, PETER SALLIS as Clegg and BRIAN WILDE as Foggy. Life drifts by at a slow and hazy pace here in the beautiful village of Holmfirth, in the verdant Yorkshire Dales - home to our three favourite over-sixties schoolboys, Compo, Foggy and Clegg. Engaged in a multitude of activities that men of a younger age would consider themselves too old for, our retired (but not retiring) trio continue to get themselves into .. Starring BILL OWEN as Compo, PETER SALLIS as Clegg and MICHAEL ADRIDGE as Seymour Utterthwaite. With Foggy off to pastures new, it's time to welcome a new face to Holmfirth - that once quiet backwater in the beautiful Yorkshire Dales - in the form of Seymour Utterthwaite, former headmaster and amateur inventor. And invent he certainly does. So look out shoppers, there could soon be some new stuff on the market - like a state-of-the-art ..